This is a Halloween treat even grown-up Trick-or-Treaters will enjoy! 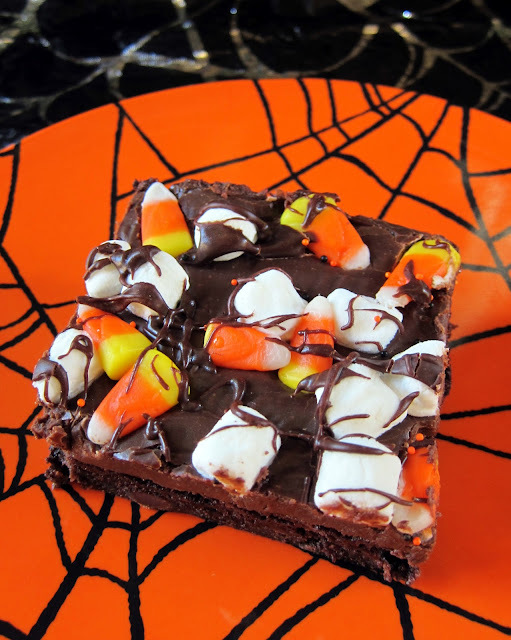 They are a variation on Rocky Road Brownies using candy corn instead of nuts. These brownies are scary delicious! The frosting on these brownies is incredibly decadent. Make sure you have a big glass of milk on hand to wash it down with. Use the leftover candy corn to make some Homemade Butterfingers. Prepare brownies according to directions on box. In a medium saucepan, melt 2 cups chocolate chips with condensed milk over low heat, stirring until well blended. Spread over hot brownies. Top brownies with miniature marshmallows and candy corn. Bake 2 to 3 minutes, until marshmallows begin to melt. Microwave 1/3 cup chocolate chips on HIGH for 1 minute. Stir until melted. Drizzle melted chocolate over marshmallows and candy corn. Cool to room temperature. Chill and cut into bars. I love the vibrant colors. Need to make these for our pumpkin carving party tomorrow night. These look great! I might try substituting the candy corn for Reese's pieces just because I really don't like candy corn! Thanks for the great idea... Will definitely bring some to my office next week! I made these yesterday and they are delicious!